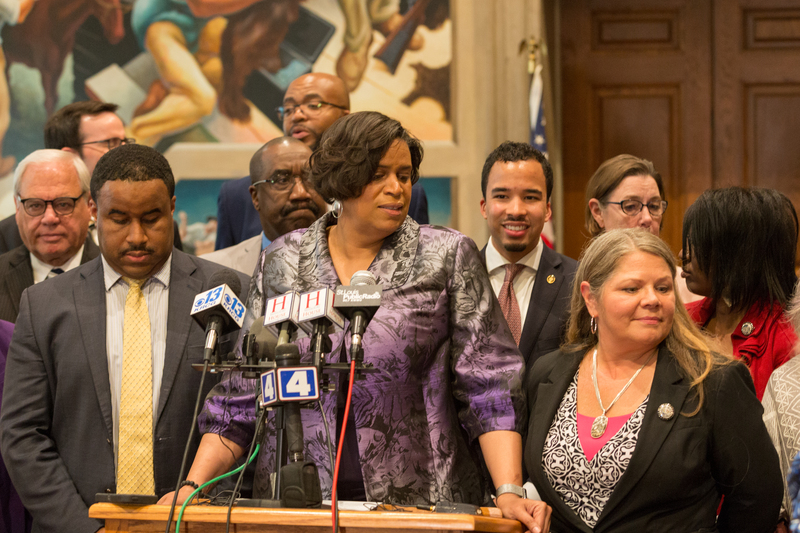 House Minority Leader Gail McCann Beatty (D) (center) – May 18, 2018. Representative McCann Beatty (D) pointed out the cloud of Governor Greitens’ (r) behavior and impending impeachment along with enumerating the majority’s efforts to cut state revenue, to hobble public education, and to diminish workers’ ability to collectively bargain. 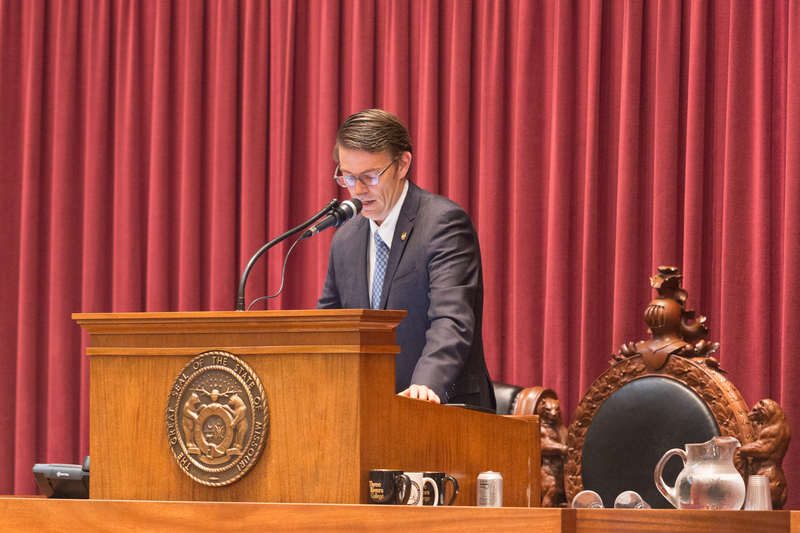 On Friday night after the close of the regular session and after short end of session majority and minority press conferences the special session addressing the possible impeachment of Governor Eric Greitens (r) was called to order. The spaces between the pillar in the side galleries were crammed with media tripods and cameras. The Press Gallery had a full contingent. Media in a side gallery. 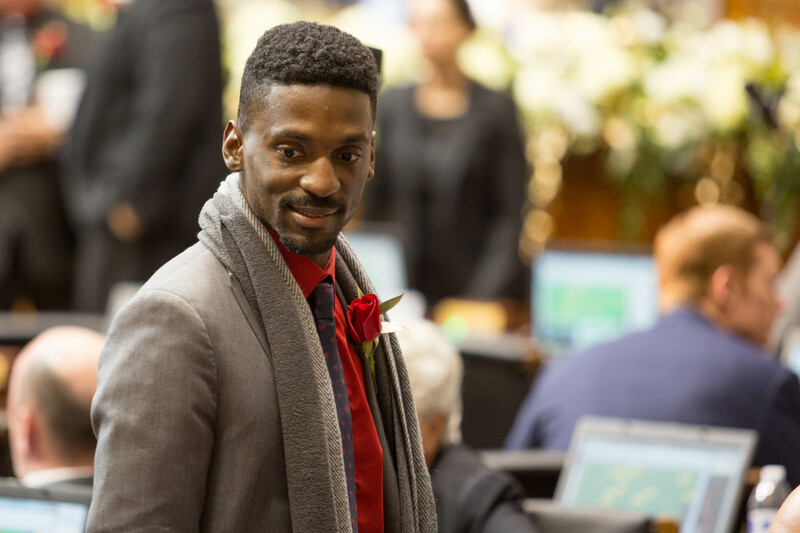 The opening of the session was like the opening of any other session – the gavel, a prayer, the Pledge of Allegiance, and the start of business. Speaker Todd Richardson (R) calls the special session to order. After the formalities the session was adjourned – the body of the House will return once the House Special Investigative Committee on Oversight has recommendation(s). 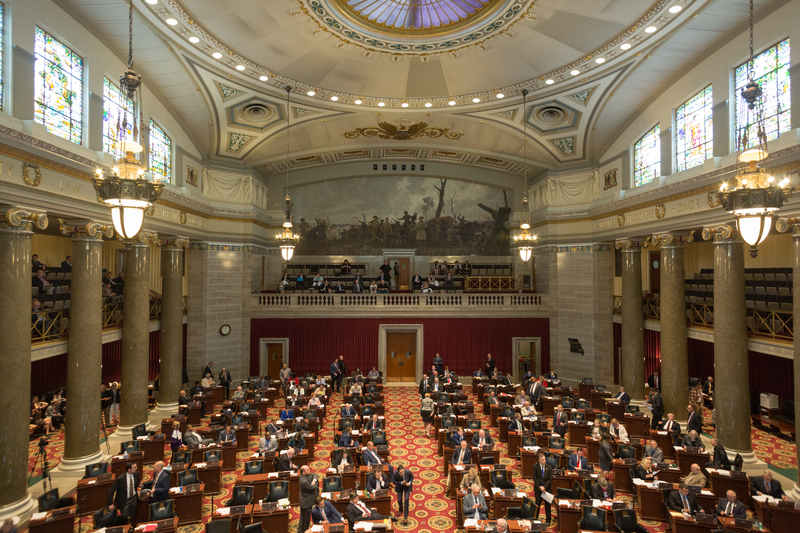 The regular session of the Missouri General Assembly ended today in a day long manic flash of bill activity. 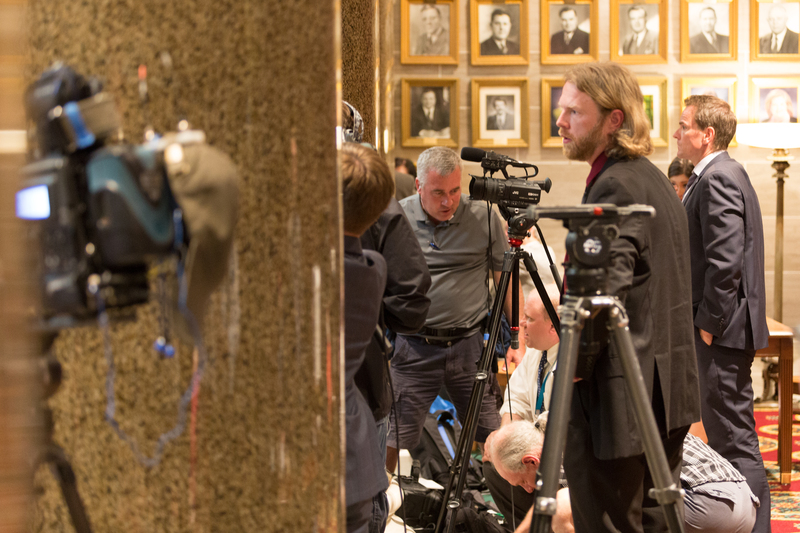 The special session, concerned with the possible impeachment of Governor Eric Greitens (r), started this evening in brief understated formality. 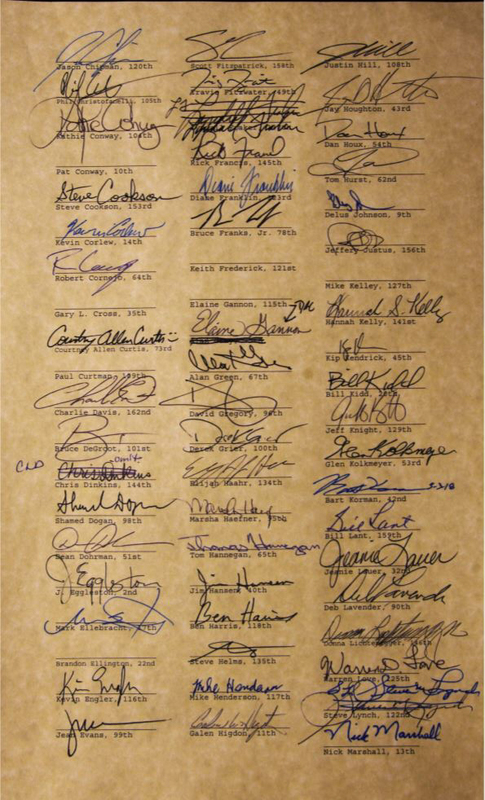 Quorum call, a prayer, the Pledge of Allegience, and a message to the Senate. 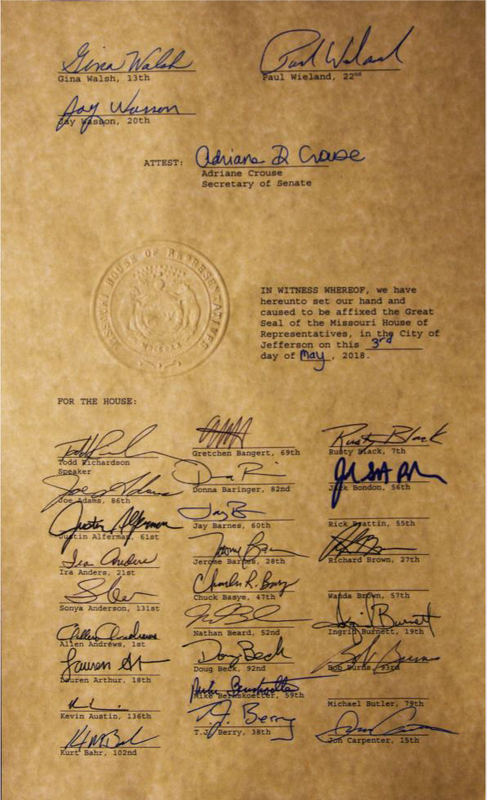 We, the undersigned, constituting at least three-fourths of the members of the Senate and at least three fourths of the members of the House of Representatives pursuant to Article III, Section 20(b) of the Constitution of Missouri, hereby call a special session of the General Assembly to convene at 6:30 p.m. on May, 18, 2018, for the sole purpose of considering the findings and recommendations of the House of Representatives Special Investigative Committee on Oversight including, but not limited to, disciplinary actions against Governor Eric R. Greitens. 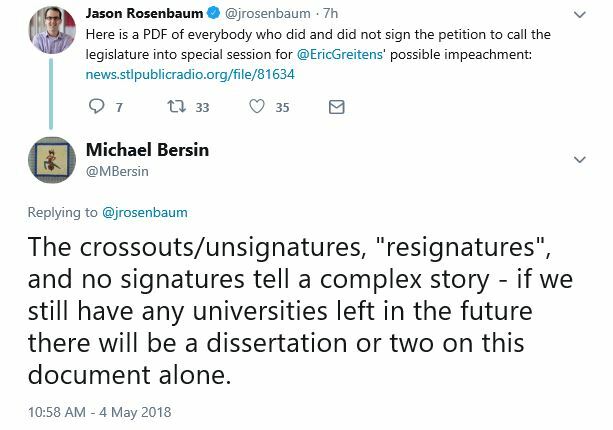 The crossouts/unsignatures, “resignatures”, and no signatures tell a complex story – if we still have any universities left in the future there will be a dissertation or two on this document alone. 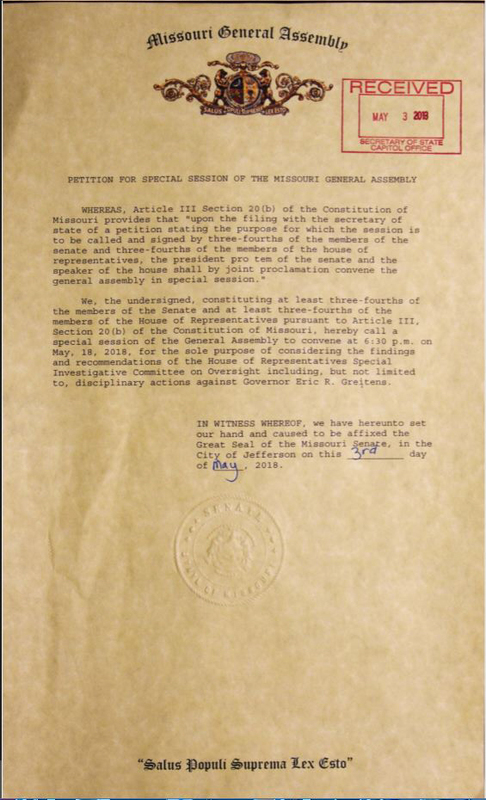 Yesterday both houses of the Republican controlled Missouri General Assembly submitted a sufficient number of signatures to call for a special session to consider the impeachment of Governor Eric Greitens (r). The special session will begin at 6:30 p.m. on May 18th, after the end of the current regular session. Missouri lawmakers say they will convene a special legislative session to consider impeaching Missouri Gov. 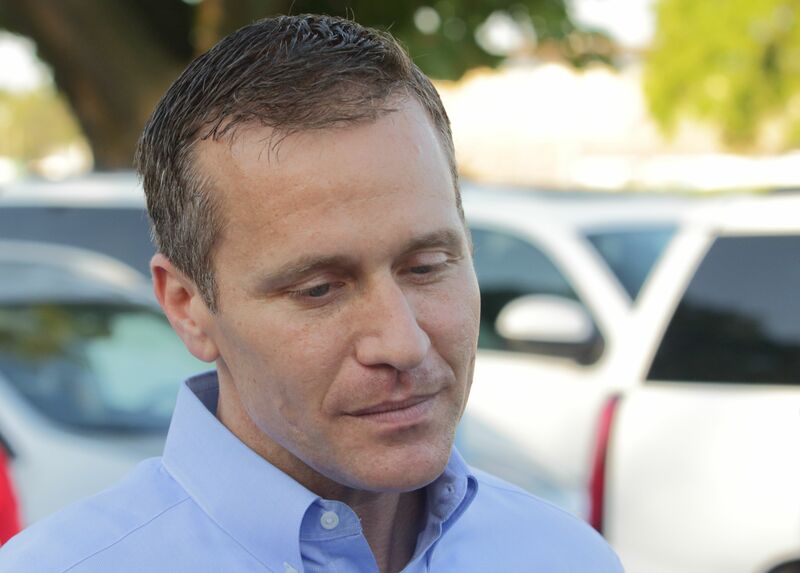 Eric Greitens, as the embattled governor faces two felony charges. “This was not a decision made lightly, and certainly not without great deliberation and effort,” House Speaker Todd Richardson, R-Poplar Bluff, told reporters Thursday. 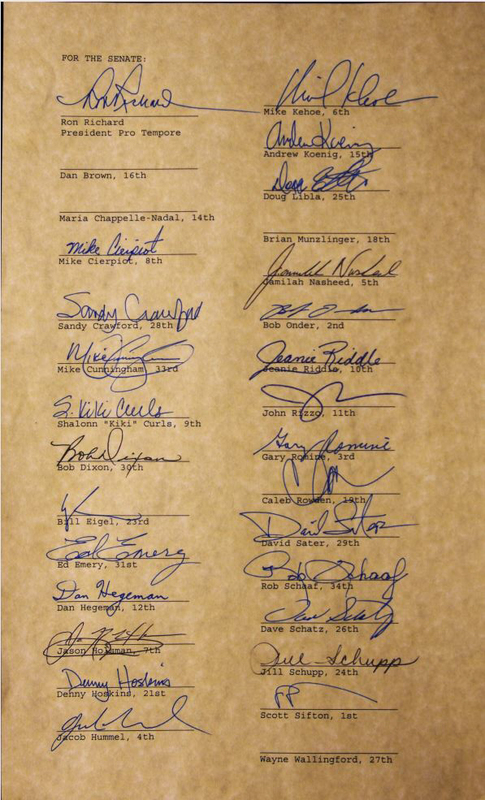 Richardson said 138 members of the House and 29 senators had signed a petition to call the special session — more than the three-quarters of each chamber that is required to convene the session. Missouri currently has 161 House members and 33 senators — a solid majority of them Republican. Republicans hold 114 of the House seats and 24 in the Senate. 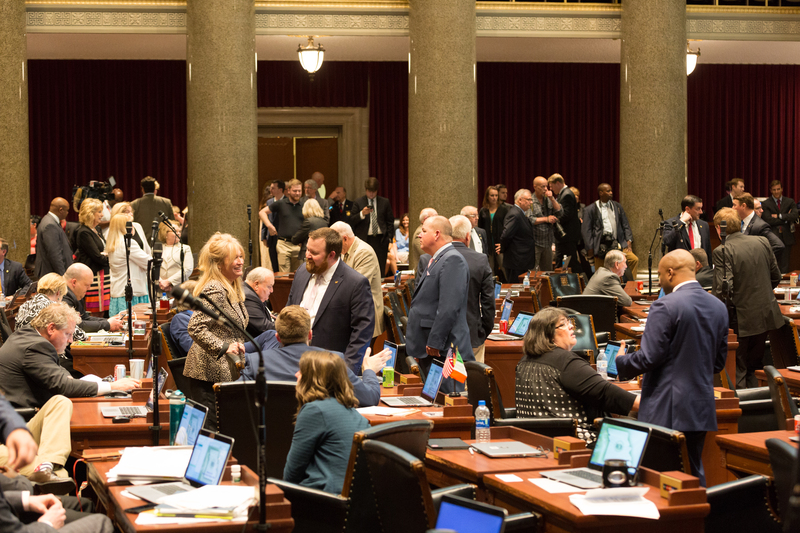 The special session is scheduled to begin the evening of May 18, which is the last day of the legislature’s regular session, and will last for 30 days. 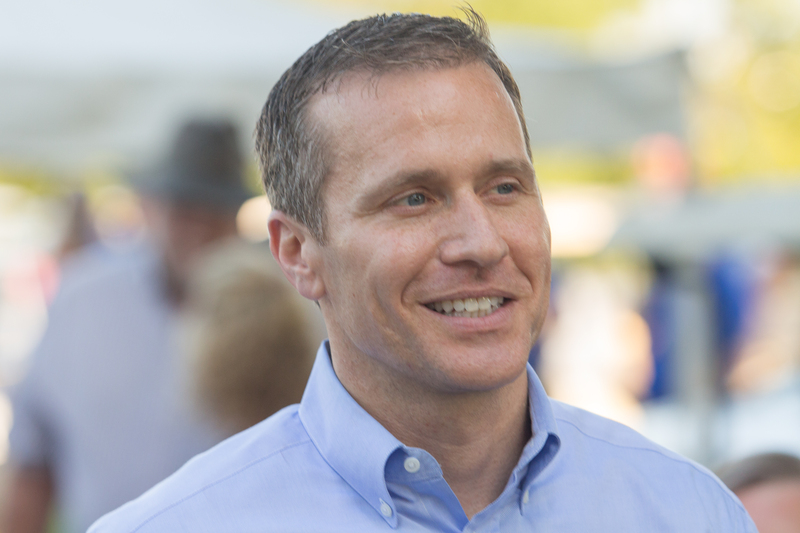 Today, Governor Eric Greitens announced his plan to call the legislature back for a special session to protect the lives of the innocent unborn and protect women’s health. The session will focus on protecting pregnancy resource centers and proposals for common-sense health and safety standards in abortion clinics. “I’m pro-life, and I believe that we need to defend life and promote a culture of life here in the state of Missouri. For me, that comes from the work I’ve done. I’ve worked with kids in Cambodia who’d lost limbs to land mines and who were survivors of polio. Children of the street in Bolivia, and children who were orphaned because of war and genocide. I also saw the value of true love and compassion in one of Mother Theresa’s homes for the destitute and dying. I saw the power of faith leaders who stood up and affirmed that every life had value and worth. Our faith community and volunteers do incredible work to support people in need. And there’s few finer examples than the work pregnancy care centers do across our state. These charitable organizations and community groups work with pregnant women and new moms. They offer newborn children food and clothing, offer free pre-natal care and ultrasounds, and help find women find housing and even pay for utilities. They help with adoption when needed, and protect women from domestic abuse. They even do job training and help women find jobs to support their new families. I also believe that we should have common-sense health and safety standards in all medical facilities. A court decision from earlier this year weakened our state’s health standards in abortion clinics. So, we’re also proposing some basic, common-sense standards to keep Missourians safe. And we’re proposing a fix that will stop abortion clinics from interfering with emergency responders. If a woman needs help, abortion clinics shouldn’t be able to tell an ambulance to come slowly–to not use their lights and sirens–or to go around to the back gate, just because they are worried that an ambulance arriving might make their abortion clinic look bad. Interestingly, neither Medicaid expansion nor repeal of the death penalty are on the right wingnut agenda for the session. That makes this special session anti-abortion, not “pro-life”. JEFFERSON CITY, Mo. 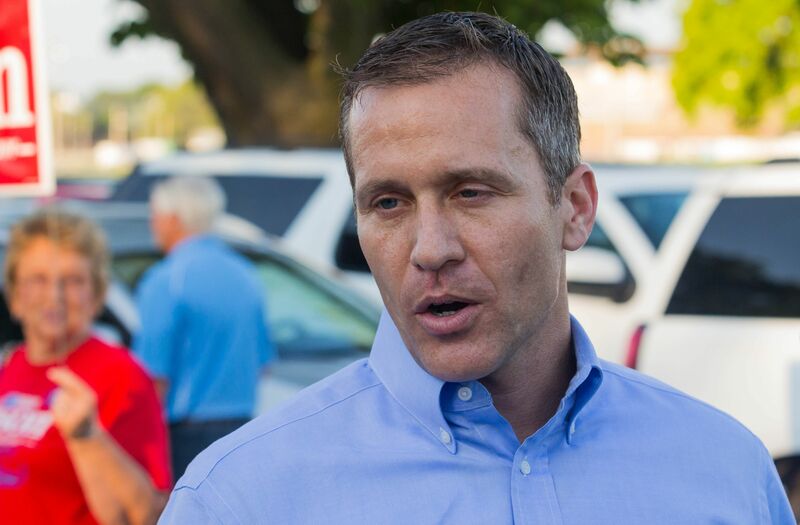 – Today, Governor Eric Greitens called on lawmakers to return to Jefferson City for an extraordinary legislative session — costing Missouri taxpayers $20,000 a day — to restrict Missourians’ reproductive health and rights. The governor called for the Legislature to pass more medically unnecessary restrictions targeting abortion providers, and override a St. Louis City law that protects people from being fired or discriminated against for getting pregnant, using contraception or any other reproductive health decision. Planned Parenthood Advocates in Missouri opposes this extreme, frivolous and expensive effort to endanger women’s health with even more medically unnecessary restrictions on safe, legal abortion. 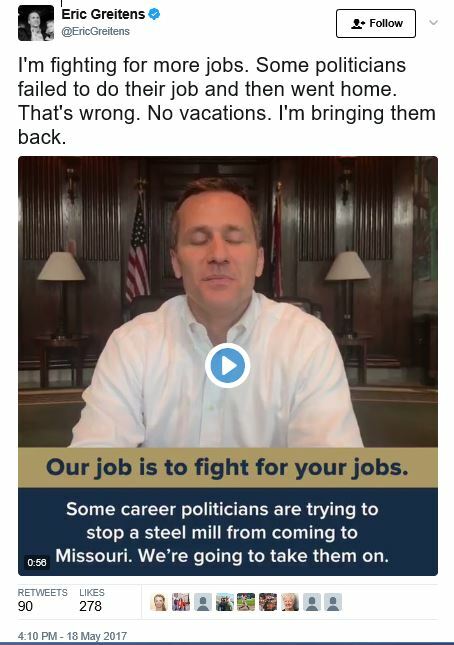 Today, Governor Eric Greitens announced that he is bringing the legislature back for a special session on Monday with one topic: the steel mill bill. At the end of the 2017 legislative session, some career politicians in the Senate blocked efforts to bring a steel mill and other projects to the state of Missouri. Those projects could create hundreds of jobs in southeast Missouri. 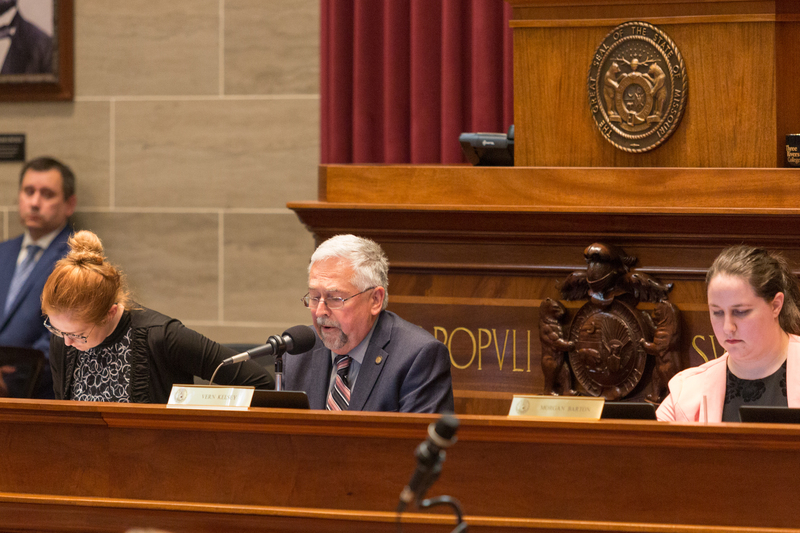 This issue was championed by Rep. Don Rone (R-Portageville)during the 2017 legislative session, and an amendment aimed at addressing the issue was passed by the House (148-2) but blocked in the Missouri Senate. The special session will begin at 4:00 P.M. on Monday. I’m fighting for more jobs. Some politicians failed to do their job and then went home. That’s wrong. No vacations. I’m bringing them back. Representative Cora Faith Walker (D) [2017 file photo]. Not a career politician, but I do know that holding elected office & being a true public servant is SO much more than a photo op. Not a career politician, but a public servant. Gov. Jay Nixon today announced that a special session will not be necessary after agreeing with an alternative interpretation of current appropriation authority offered by legislative leadership. Consistent with this reading of the law, the Governor will be using existing appropriations for the State Emergency Management Agency in HB 2008, Section 8.290 to fund the ongoing operations of the Missouri National Guard and the Missouri State Highway Patrol in Ferguson and the St. Louis region. The appropriation language in Section 8.290 has been traditionally interpreted as limited to the use of matching grants and exclusively for the expenses of the State Emergency Management Agency. Costs resulting from civil unrest are not eligible for federal reimbursement under a federal disaster declaration. 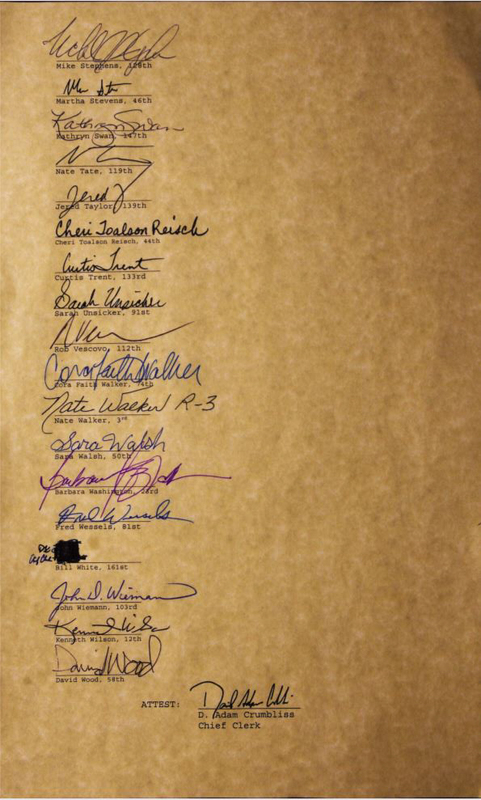 However, in a letter to all senators, Senate Appropriations Chairman Sen. Kurt Schaefer wrote that the state could use the $12.5 million appropriation in Section 8.290 for costs incurred during an emergency. 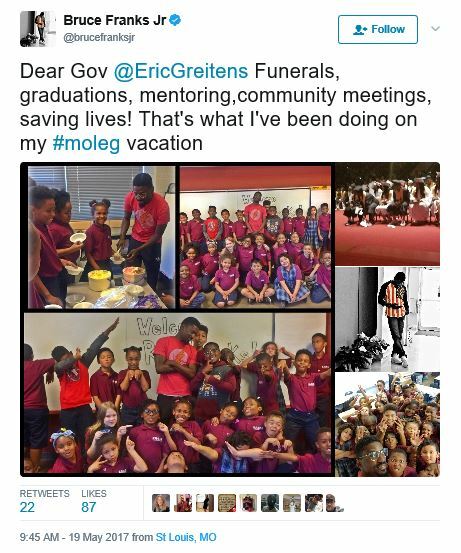 “After researching this issue and discussing it with appropriations staff, I can find no apparent reason why the Governor cannot use this appropriation for either the Guard or Patrol given that he has declared a state of emergency in responding to Ferguson,” Schaefer wrote. The Governor’s agreement with this interpretation negates the need for a special session for the expenses of the National Guard and the Highway Patrol in providing enhanced security in Ferguson and the St. Louis region. If the republicans all agree they can’t complain later, right? Gov. Jay Nixon tonight announced he will call a special session of the Missouri General Assembly to provide critical funding for the ongoing operations of the[ ]Missouri National Guard and the Missouri State Highway Patrol in Ferguson and the St. Louis region. The Governor said that with the ramped up presence and role of the Guard and Highway Patrol in the region, financial obligations are on track to exceed the current appropriation authority for emergency duties. In a call with legislative leaders tonight, the Governor emphasized the importance of taking action quickly to ensure that Guard members are paid on December 15. Additional details regarding the timing and scope of the special session will be released in the coming days. The Fiscal Year 2015 state budget approved by the legislature included $4 million for National Guard state emergency duty response costs and $3.4 million for the State Emergency Management Agency (SEMA) for expenses incurred by state agencies, including the Highway Patrol, in responding to disasters and emergencies between July 1, 2014 and June 30, 2015. Gov. Nixon said that in addition to obligations that have already been incurred, other activities such as debris removal could result in additional costs. Exceeding the emergency duty appropriations would also limit the ability of the state to respond to other emergencies that could arise. 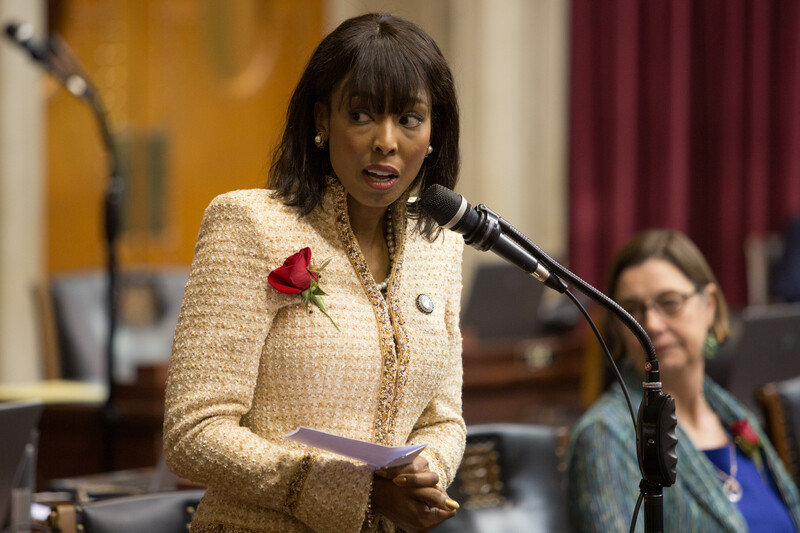 Unlike during prior emergencies, a special session is necessary for Ferguson-related obligations because the appropriations for the state’s emergency duty costs no longer include an “estimated” designation. 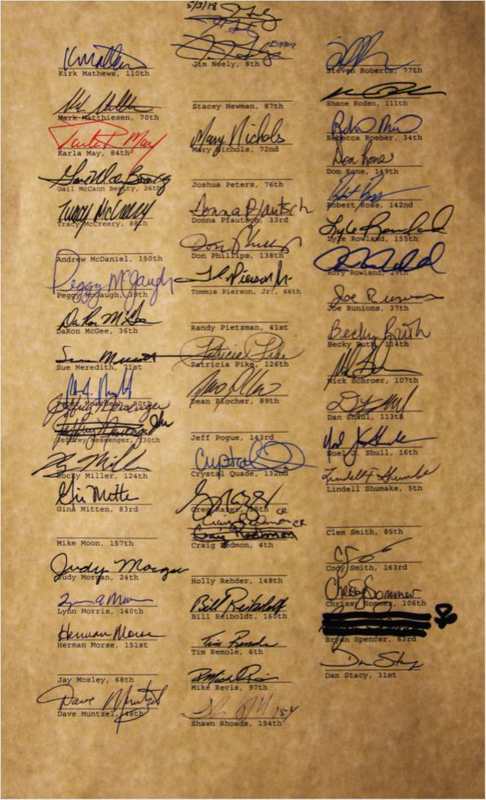 Without the estimated designation, the Governor must ask the legislature to appropriate additional amounts when needed. You’d probably be surprised by the number of people who don’t comprehend that.